Winter weather has certainly not been on our side the last two weeks, making it difficult to get games and practices in. Even with that hurdle, the Meridian Athletic teams have been on a roll! From career high points scored in a game to team high points in a meet, Mustang Athletics have it going on! Make sure to come out to an upcoming event to catch all the action. A copy of the winter sports schedule is available at the bottom of this article or by stopping in to the High School Office. Highlights from each winter sports team are below. On Saturday, February 9th, the Lady Mustangs concluded your regular season with a 4th place finish in the JPC team challenge. The girls got off to a good start opening with a 200 game one baker score. The girls worked well together finishing in second place after the 5 baker games. From there they put up some good scores and had an overall 4th place finish behind conference champs Gladwin, Farwell and Clare who finished second and third. The ladies were paced by Emma VanDongen with games of 176,136,& 177. Jamison Piper with games of 146 & 134, Kristen Holsworth with games of 127 & 151, Morgan Miller with games of 148, 159, & 128. The Lady Mustangs next action is at the JPC singles meet this Saturday in Clare. On the boys side, Meridian came in 3rd place for their Saturday tournament with a 3rd place in the Jack Pine Conference. Congratulations to both the boys and girls teams on a great season. These ladies are on fire currently! 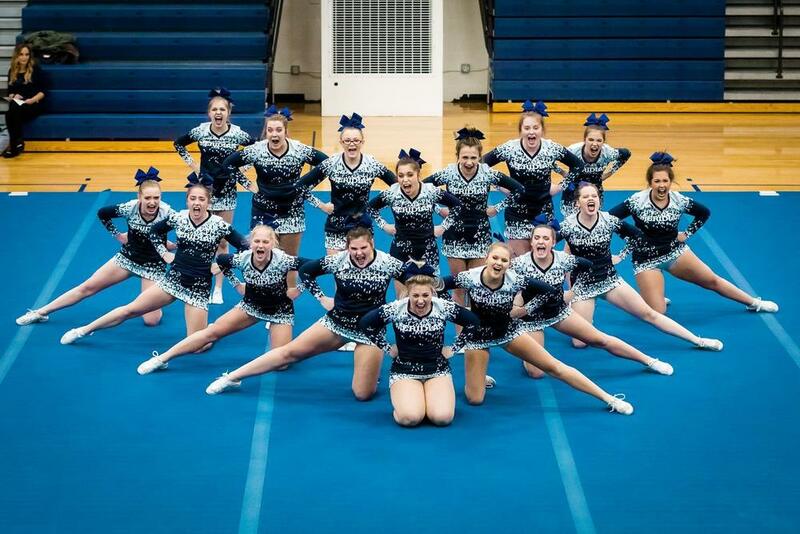 They are ranked number 1 in the state right now and in their last competition, they had the highest score a Meridian Cheer team has ever received, a 774.02 at Houghton Lake. The ladies scored 233 in the first round, 223.52 in the second round, and a all season high score of 317.5 in round three. "My team took the mat today with determination and the fire to win," Meridian coach Val MacKenzie said. "We have been practicing each day as if we are at our district, regional, and state finals. This team is very excited and has one goal in mind: states." Read more about the Houghton Lake competition here. that's not all these ladies have done this season either! They won their Mustang Cheer Corral event on Tuesday, February 5th. Before the Houghton Lake event, the team had a season high round three score of 311.099 points to give them an event total of 757.06. Want to see even more of what the cheer team has been up to?Check out another competition that they competed in back at the end of January here, courtesy of the Midland Daily News. The wrestling team just finished their Division 3 individual meet on Saturday in Freeland. Travis McDonald at 130 and Jake Schultz at 160 each placed first; Matt Person at 152 and Brady Solano at 215 each placed second; Nick Dodman at 135, Greg Cowling at 171 and Jimmy Miron at 189 each placed third; and Brayden Cowling at 160 placed fourth. With this many wrestlers headed to Regionals now, they tied a 2004-05 season record for sending eight regional qualifiers. Other compeititors that won matches but did not advance to Regionals include Mykel Booth, 119, and garret Mogg, 130. "When we got the seedings last night, we had an idea we could have a pretty good day," Mustangs' co-coach Corey Cordero said. "I told the team that our goal was double-digit qualifiers, and we came really close to that. And eight is obviously an awesome number. We seem to be hitting our stride." Read more about the team's district competition here in the Midland Daily News. The girls basketball team had a great win over Beaverton on Thursday, January 24th. The Mustangs led 11-6 after one quarter and 21-11 at halftime. Beaverton had a 7-6 edge in the third to cut it to 27-18, and both teams scored 13 points in the fourth. Audrey Kielpinski led Meridian with 20 points and seven rebounds, while Ashtyn Kelly had nine big points off the bench, and Mya Hall added five points, four steals, and three blocks. "Audrey played really well, and Ashtyn Kelly gave us the spark we needed. She came in and hit three 3's in the first quarter," Stockford said. " ... With about four and a half minutes left in the first quarter, we still didn't have any points, so I brought her in, and she hit two 3's back-to-back and kind of sparked us." Brett Barriger had a career night for the Meridian boys' basketball team in a 53-38 non-conference victory at Carson City-Crystal on Tuesday., January 22nd. "Brett had the hot hand and our team has willing passers," Meridian coach Mitch Bohn said. "When he got an open look, he made it. He shot the ball very well." Gabe Brady added 10 points and Lucas Lueder had seven points for the Mustangs, who outscored Carson City-Crystal 20-9 in the fourth quarter to put away the game. Read more of the Carson City game here, from the Midland Daily News. Barriger wasn't done with the Carson City game. Coming off a career-high 28 points, including six 3-pointers, Barriger knocked down all five of his attempts from behind the arc in Friday’s 67-36 Jack Pine Conference victory over rival Beaverton. Barriger finished with a game-high 21 points and added four assists. “He’s just getting good looks,” Meridian coach Mitch Bohn said of the senior wing. “He had a heck of a week.” Lucas Lueder added 18 points, 10 rebounds and four assists for the Mustangs, while Gabe Brady finished with eight points and 12 rebounds. The Mustangs swept the Beavers on Friday, January 25th. A packed Mustang house was in store with the Pep band in the stands. More information on the sweep of Beaverton available here form the Midland Daily News. The Mustangs certainly did not stop there! The Meridian boys’ basketball team’s outside shooting was off the mark on Friday at Clare, but the Mustangs dominated in the paint for a 55-39 Jack Pine Conference victory. “Overall, we didn’t shoot the ball very well,” Meridian coach Mitch Bohn said, referencing the Mustangs’ 4-for-24 3-point shooting. “But we have a fairly diverse offense and used our size advantage to score inside.” More about the Clare game can be found in the MDN article here. The Houghton Lake bobcats headed to Meridian on February 4th and left with a loss. The Mustangs dominated the game, shutting down the Bobcat's leading scorers. Another boys basketball win. Some congratulations are also in order for Coach Mitch Bohn on earning his 400th career win, earned the night the Mustangs played the Bobcats.Check out some history from previous players in this article about Coach Bohn from the Midland Daily News. It has been a great few weeks of Meridian Athletics. Come on out and catch some action at an upcoming event. Attached here is a link to the pocket schedule that shows all winter season events.